Incoming PVM Class of 2018 Interns: (front row, left – right) Drs. Matthew Hull, Lauren Diangelo, Alexis Powers, and Andrea Miranda-Merly; (middle row, left – right) Drs. Hilary Wright, Maria Saddler, and Elizabeth Young (Wasson Veterinary Pharmacy Resident); (back row, left – right) Drs. Fiona Inglis, Alexandra Gareau, and John Wagner. A new class of interns began their duties in Purdue Veterinary Medicine's Veterinary Teaching Hospital last Monday, June 12. The nine interns will participate in a year-long clinical program focused on either small animal rotating internal medicine and surgery or large animal internal medicine and surgery. PVM's clinical intern program is designed to provide advanced training to qualify each intern for an approved residency program leading to board certification in a recognized veterinary specialty. In addition to the internship program, the Veterinary Teaching Hospital also offers a year-long residency position in veterinary pharmacy, newly named the Wasson Veterinary Pharmacy Resident in honor of the donors who contributed significant funding to support the position. The new Wasson Veterinary Pharmacy Resident also started June 12. 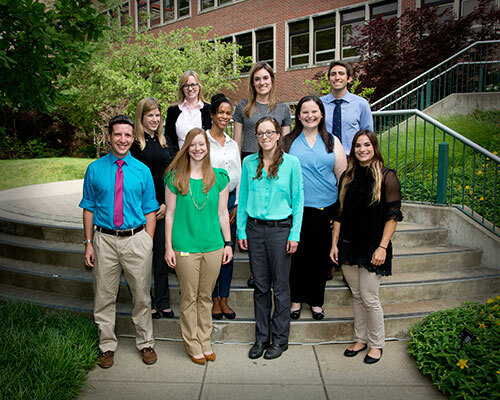 Please help extend a warm welcome to these newest members of the Purdue Veterinary Medicine family! The outgoing class of interns as well as the graduating Veterinary Clinical Sciences residents and a VCS graduate student were honored last evening (Thursday, June 22) at a recognition ceremony in the Dauch Alumni Center. Look for complete coverage of the VCS/VTH Recognition Ceremony in the next issue of the Vet Gazette.